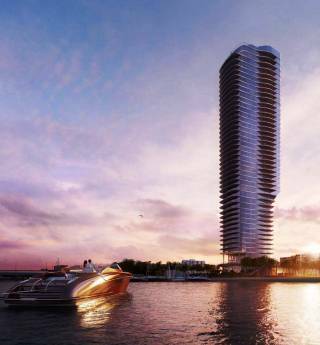 Architectural rendering of the new 47-story luxury condo tower Una, to be located at 175 SE 25th Rd. in Brickell. Vladislav Doronin and Jonathan Goldstein are the principal partners on the new luxury condo tower Una, to be built on the location of an existing older building at 175 SE 25th Rd. in Brickell. Developers of the upcoming luxury condo Una built a sales gallery on the 11th floor of the existing building at 175 SE 25th Road they purchased for $48 million. They acquired the building by buying each of the existing condos from their owners.